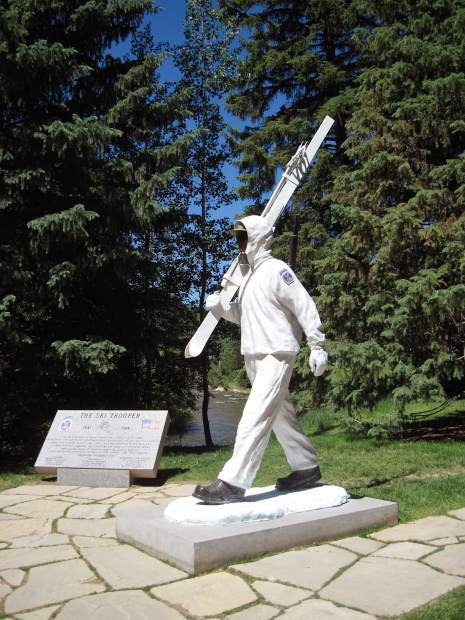 Heading from the parking structure to the Covered Bridge in Vail Village, it's hard to miss this 10th Mountain Division Memorial, part of the town of Vail's Art in Public Places tour. What: Vail Village Art Walks. Where: Meet at Vail Village Welcome Center, tour winds through the village. When: Wednesdays through Aug. 29, 11 a.m.
VAIL — The public art collection around Vail includes a slopeside Pirateship Park and a Children’s Fountain, and the 40-plus piece collection includes materials from bronze to water-jet cut stainless steel. On Wednesdays, the town of Vail’s Art in Public Places leads Vail Village Art Walks at 11 a.m. The free hour-long tours take place Wednesdays through Aug. 29 and meet at the Vail Village Welcome Center. The tour winds its way through the Village with discussions of the history of the Vail Valley, the founding of Vail Mountain, the master planning of the village and the importance of site-specific art. The town’s public art collection includes more than 45 works ranging from paintings, sculptures, murals, playground components and site-integrated art. A printed map of the town of Vail’s public art collection is available at the Vail Village and Lionshead welcome centers. The map not only features 36 works of art in a walkable area of Vail Village and Lionshead, but it also includes public art beyond the town center to explore. More than 30 works of art in the town of Vail’s collection are created by Colorado artists. For a virtual tour of the collection, visit http://www.artinvail.com. Tours are subject to cancellation.